Notification Groups allow you to create groups that you can send notifications to that are tailor-made to your audience’s interests! In this article we’ll go over how to set them up, how to access them in the app, as well as how to send a notification to a group. What are some use cases of Notification Groups? 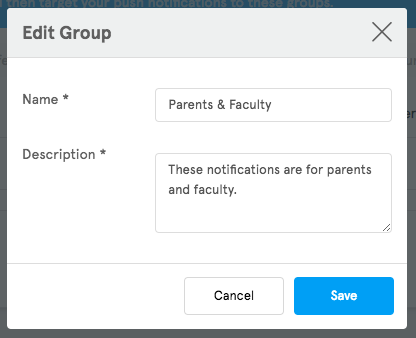 If you have a School app you can create a group for each grade to send out grade-specific notifications. If your app is Fashion-oriented, you can create different groups for different interests such as makeup, clothing, shoes, accessories. etc. If you’re working on a Church app, you can set up groups for the different ministries, as well as prayer requests, small groups, and daily bible verses. Now that you know what Notification Groups are, and have some examples of what you can do with them, let’s go over how to set them up. Once you’re on the Notification Groups page, in order to create a new group all you need to do is click on the “+ Add Group” button. 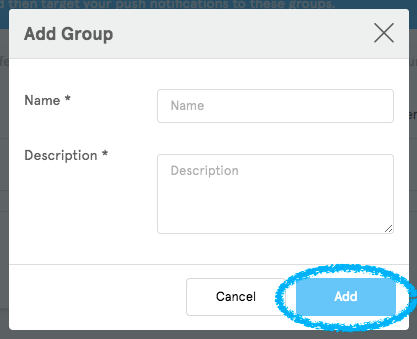 Once you’ve clicked on the Add Group button and window will pop up where you’ll be asked to give the group a Name and a Description. 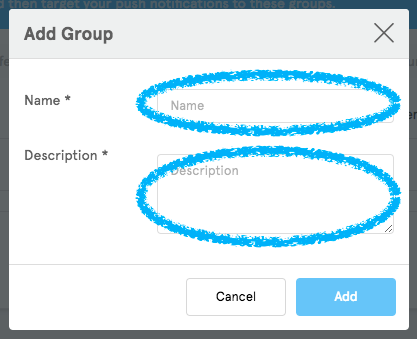 Once your group has a Name and an Description, simply click “OK” to add the group to your app. Now that you know how to create a new Notification Group, let’s go over what else you can do in the Groups page. If you would like to edit a pre-existing group, click on the Pencil icon next to the group that you’d like to edit. Once you’ve clicked on the pencil icon, you’ll see a window pop up with the group’s Name and Description. Make the edits to the name and description that you want to make here. After you’ve made the edits that you want to make click “Save” to save the changes. If you would like to remove a Notification Group from your app, all you need to do is click the X next to the group that you want to delete. You will be prompted to verify that you want to remove the group before it is removed from the app. 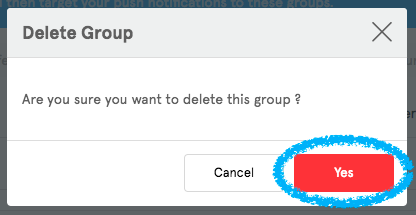 If you would like to continue with the removal of the group, click Yes on the prompt. 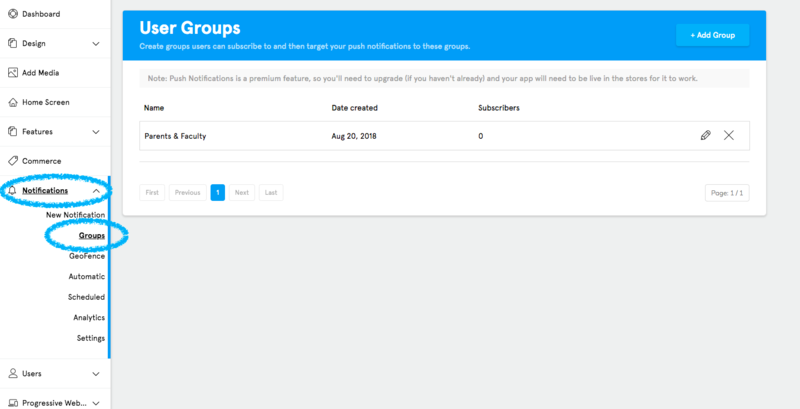 Note: If you decide to re-add the group to your app, all users who were previously subscribed to the group will need to re-subscribe to it in order to receive notifications for that group again. How do Notification Groups work in the app? Now that you know what Notification Groups are, and how to create them, let’s go over how they work in your app. If you have notification groups set up in your app, the very first time that users open up your app, they will be asked if they would like to subscribe to any of the notification groups. This will only appear on the very first open of the app, and won’t automatically appear in the future when the app is opened. If you create notification groups after your app is live, users can subscribe and unsubscribe by opening the app’s side menu and tapping on “Notifications”. Note: If you decide to disable the side menu users will be unable to access this in the app. Also, if you hide the “Notifications” option in the Language Settings, user’s won’t be able to access this either. If you decide to change the verbiage of the “Notifications” option in the Language Settings, users will still be able to access this, but it will be using the differently worded link. If you would like to send a notification to a specific group, you can do so from the “New Notification” page. Once you’ve set up your notification, simply select “Groups” then the group that you want to send the notification to. If you would like to learn more about our Push Notifications, you can do so here. Don’t want to send a notification to all of your users, but still want to send it to those who are interested in it? Notification Groups are the perfect solution for that! You don’t want to bombard users with options when it comes to notification groups. Think about what types of groups would work best and how they can enhance the user’s experience with your app.